India Satire: Nation asks question: Who controls CAG Government or BJP? Nation asks question: Who controls CAG Government or BJP? India started asking question as actually who controls Comptroller and Auditor General of India (CAG). 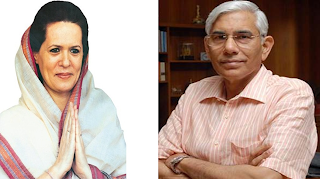 While general perception was that CAG was independent body reporting to India's President and presents its report to Parliament, it changed drastically after ex-CAG Officer RP Singh's allegation and Sonia Gandhi's frustration. To go to the root of the scam, first find out how much bill Murli Manohar Joshi pays through his mobile phone. Much can be discovered there. Murli Manohar Joshi can clarify what dishes CAG head Vinod Rai like. First assumption is that Rai hates Pizza and Burger. Sometimes public looks fool when it sees that 2G case is still to be resolved. Oh Bofors case is also still to be resolved, I believe.